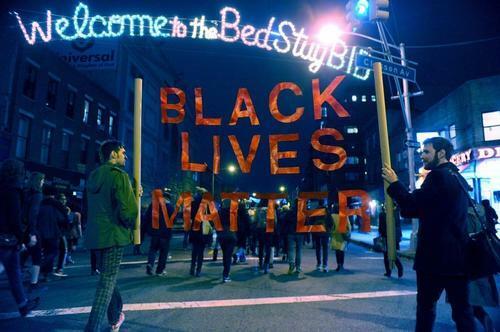 Nathan and Dominic walk a BLACK LIVES MATTER banner past the Christmas lights in Bed Stuy. One of my pals from the People’s Puppets of Occupy Wall Street had joined the protests the other day over the murder of Eric Garner and continued NYPD violence against people of color. This was against the wishes of Hizzonor: There had been a request from Bill de Blasio for protesters to abstain from hitting the streets in the wake of the execution-style shooting of two NYPD cops in Bed Stuy on Saturday. Police Commissioner Bratton had asked for his unions to “stand down” from rhetorical battling with the mayor for the time being. The NYPD had (mostly) complied. The protesters did not. The Daily News went ballistic over this: Arrogant, self-righteous and offensive, they’ve worn out their welcome. Anyway, Nathan Leigh replied with an open letter to the Daily News. I give you the text here. If you want to visit his Tumblr site and see his really cool video and song, you should go here. I’m Nathan Leigh. I’m the guy on the left in the photo you used in your recent editorial about #BlackLivesMatters protests. The guy on the right is Dominic Ryan. We’d appreciate it if you credited the banner to The People’s Puppets of Occupy Wall Street. I wanted to thank you for your recent piece, for keeping the conversation about the over-policing of communities of color active, though we clearly have slightly different perspectives on the matter. For instance, you refer to our “revolting lack of respect” for the NYPD. Personally, I feel this lack of respect is entirely deserved. About 3 years ago, I was personally beaten by several members of the NYPD badly enough that my lung collapsed as a result, while trying to comply with an order to disperse at a demonstration. So I hope you understand that my lack of respect comes from an honest place. However, you misunderstand what these protests are about. While many of us do possess a “revolting lack of respect,” for the NYPD, what we are actually revolted by is the lack of respect our society, and law enforcement in general, has for the lives of our black and brown friends and neighbors. I find it fascinating that you should use a picture of two white protesters to misrepresent this grassroots movement, organized primarily by young people of color as an anti-NYPD movement. In fact, that picture was from a demonstration organized in the wake of the non-indictment of Darren Wilson, and had absolutely nothing to do with the NYPD. It’s also clear that you chose the photo as a comment about the recent tragic shootings of officers Rafael Ramos and Wenjian Liu which happened in the neighborhood of Bed Stuy, where that photo was taken. However, their murders were completely unconnected to the movement in general, and that picture specifically, which again is from November. Though I understand the selection of the image. To photographer Robert Sabo’s credit, it is a fantastic picture with excellent composition. He is clearly a talented photographer. Let’s be clear, this is a movement about racial justice. This is a movement seeking to reform and eliminate the instruments of white supremacy and racial oppression, in which law enforcement often plays a notable part. However, this is not limited strictly to either the NYPD or Ferguson Police Department. The tentacles of white supremacy extend to city councils and state governments which redraw districts to disenfranchise black voters, as well as media outlets which sensationalize the protests as riots in an effort to discredit them. You mention in the editorial that we have “inconvenienced thousands” with our protests. However I would point out that police policies like Stop and Frisk, and Broken Windows have also inconvenienced thousands by disproportionately targeting people of color, despite crime rates, and drug usage in particular, being proportional to demographics. Additionally, I’d imagine the families of Eric Garner, Akai Gurley, Sean Bell, Kimani Gray, and Ramarley Graham are all “inconvenienced” by the absence of their loved ones during this holiday season. While I’m very sorry to have inconvenienced thousands, I’d like to point out that it’s terribly inconvenient to have to take to the streets to seek justice for our unjustly killed neighbors. We have other things we’d much rather be doing, but as long as the justice system remains hopelessly broken when it comes to the killings of unarmed civilians by police, it’s an inconvenience we’ll have to accept. You call us “arrogant, self-righteous and offense.” What I find “arrogant, self-righteous and offensive” is the NYPD’s unwillingness to be held accountable for the deaths of New York citizens at their hands. I would categorize the recent tone-deaf statements by Bill Bratton and Patrick Lynch similarly. I also take offense with your lack of respect for the Oxford comma. So, thank you for your editorial, and for making no effort whatsoever to mask your bias. It reminds us how much work there is still to do to dismantle white supremacy in America. As long as the justice system remains unfairly biased against people of color, we will continue these protests, regardless of whether you feel they’ve “warn out their welcome.” Did you ever welcome them? I don’t recall a point at which the New York Daily News took any stance that wasn’t firmly biased against this movement. Please feel free to correct me if I’m mistaken. Until the NYPD earns our respect, we will continue to revolt. PS. For further reading on the statistics motivating these protests, please check out my recent piece for Afropunk.